'Grexit' unwelcome - Moscow wants normalized relations in Euro bloc. 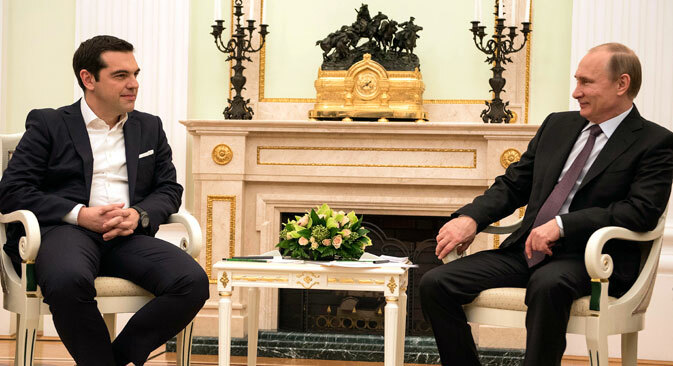 The visit of Greek Prime Minister Alexis Tsipras to Moscow and his talks with President Vladimir Putin demonstrated the willingness of the two countries to cooperate, despite the difficult relations between Russia and the EU. Russia is ready to soften the food embargo, to finance major projects in Greece and participate in privatization. Experts, however, believe that the gradual normalization of relations with Brussels is more to the advantage of Moscow than an open split in the EU. Russian experts state that the process of normalization of EU-Russia relations is extremely sluggish, and some believe that is it simply not moving forward. "I see a cautious trend toward improvement related to a change in the positions of individual countries such as Greece, Hungary, Cyprus and Italy. However, the majority of EU countries, including Germany, continue to maintain a tough line, " says Dmitry Suslov, deputy director of the Centre for Comprehensive European and International Studies at the Higher School of Economics. "It is likely that the sanctions will be extended in the summer, since, first, the 'Baltic axis' in the EU is strong enough, and, secondly, any strategic shifts in the situation in Ukraine are not expected until June," says Oleg Barabanov, research director at the European Studies Institute of the Moscow State Institute of International Relations. In this situation, those forces in Russia, which support a harsh response to EU sanctions, believe that if the policy of Brussels cannot be changed, it must be broken. And they hope to use Greek Prime Minister Alexis Tsipras as a battering ram. "Some EU countries are simply afraid to raise the issue of the lifting of sanctions in Brussels," Barabanov says. "Tsipras was the first EU leader who was not afraid to speak about it openly. And if he does not have his arm twisted, other disgruntled ones may follow his example." Tsipras himself is ready to perform the role of a battering ram; he came to power on a platform of rejecting further public spending cuts, putting him on a collision course with the EU. If he chooses to fulfil his campaign promises, he has nothing much to lose in the event of a breach of European solidarity over sanctions as well. "Greece is on the brink of default in any case. It can be put off for a few months, but it is inevitable," Barabanov says, referring to what may prompt a 'Grexit' - Greek exit from the Euro. However, the question is what Russia can offer Tsipras for playing this role. "Only a large loan – not supplies of agricultural products or gas issues will help here. Greece needs money just to survive the first few months of the split with the EU and have the funds to pay salaries and pensions – somewhere around $4 billion," Barabanov adds. According to official reports, Tsipras did not raise the issue of a loan in Moscow, but Russia has already expressed its willingness to support Greece financially, but through investment in the Greek economy rather than direct credits. Some experts question the expediency of the 'Greek ram' approach. As a method of competing in the sanctions war through opposition of individual EU member states, it is unacceptable to Moscow. "In this situation, a split within the European Union will be obvious and strongly weaken the EU," says Vladimir Bruter, an expert of the International Institute of Humanitarian and Political Studies. "There is nothing good about it for Moscow," he adds. As a result, this vacuum will be filled with anti-Russian forces, in particular the United Kingdom. Instead, it is a change in a common European approach that Moscow must work hard to achieve, including through improving relationships with European countries that sympathise with Russia. The selective removal of agricultural sanctions from those countries, whose governments speak openly in favour of the termination of European sanctions, could be a good tool. "If countries like Greece will talk about the need to abolish the anti-Russian sanctions loudly and frequently, if Moscow withdraws the embargo on imports of agricultural products from Greece unilaterally, then other countries, too, will be tempted to stand up for the minimization of sanctions. But it's a long process," Suslov adds.